Virgin Mobile is the second U.S. carrier to offer prepaid iPhone plans, which could save you more than $500 over the lifetime of the phone compared to the big three carriers. Virgin’s iPhone deals go live from June 29, while Cricket’s prepaid Phone offers start June 22. 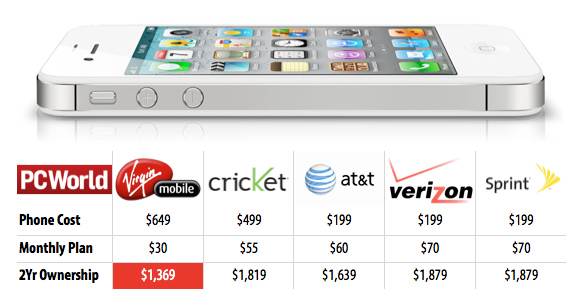 So how does Virgin Mobile’s deal stack up against AT&T, Verizon and Sprint’s offers if you want to get an iPhone 4S? Since the big three are selling the iPhone with two-year contracts, I calculated the ownership costs of a 16GB iPhone 4S over this period with the lowest-cost plan available in order to compare it with Virgin and Cricket, which do not require a contract, so you’ll pay month by month. Virgin Mobile offers the lowest monthly plan at $30, but you will also pay the most for the phone—as much as you would pay if you bought it unlocked direct from Apple. Note that Virgin charges $30 per month instead of $35 only if you pay by automatic monthly payments with a credit card, debit card or PayPal account. With Cricket you would pay some $450 more over two years due to the higher plan cost, though the phone is less expensive to buy initially. If you don’t want to put all this money upfront for an iPhone 4S, then your best bet would still be AT&T, Verizon or Sprint, which sell the phone for $199. You will however have to pony up a lot more on monthly plans. At $70 per month Sprint has currently the best deal with unlimited everything, or $60 per month on AT&T for a voice and data plan, but without the messaging add-on. 700 bucks to have an iphone... hell no! Yeah 700 is way too much! You get what you pay for. Im on virgin for the low unlimited 35 a month plan. My texts dont send or recieve 5% of the time. 1% is unacceptable. Good deal, but bad results. Funny, I was going to ask what kind of service you get for that 30/mo. I've had Verizon for some 8 years now. And while their customer service is probably the worst I've ever dealt with, their cellular service has possibly been the best.